Following the collapse of Carnell Software, Mastertronic dabbled in adventure games by rereleasing some of the old Carnell product as well as a new game Se-Kaa of Assiah by Clive Wilson and Les Hogarth. 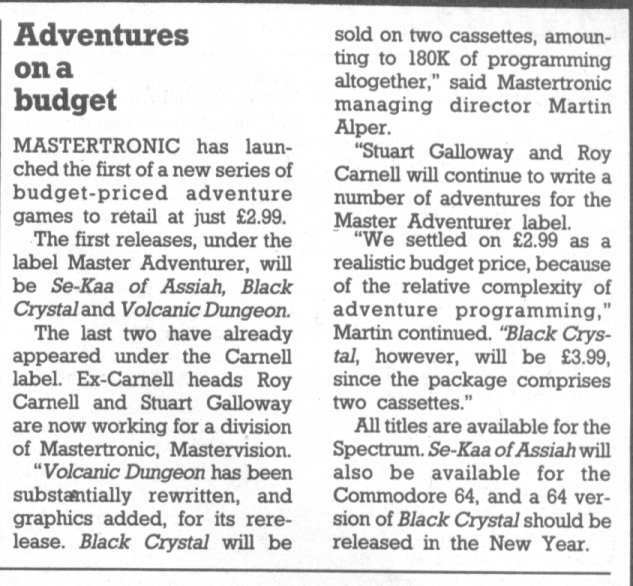 This news item in Popular Computing Weekly, 29th November 1984, rather amusingly says that Roy Carnell and Stuart Galloway were working for Mastervision. There was no such division and in any case that name was used for our venture into video distribution two-and-a-half years later.